This article features the history of table tennis and how this sport came to be. The game of table tennis is also known as ping pong. The history of this game has been the subject of extensive research by American’s Charles “Chuck” and Tim Boggan. Although the research was notably done by Englishman Gerald Gurney. His book “Table Tennis: The Early Years” is considered as the most definitive guide to the history of table tennis sport. The International Table Tennis Federation has a museum where they promote and preserve the heritage of table tennis. It was based in Lausanne, Switzerland where they first opened this museum in 2004. It was later moved to Shanghai, China in 2014. To find the origins of table tennis, you need to look at the International Table Tennis Federation’s museum. American born Charles “Chuck” Hoey, the curator is a world-renowned authority of Tennis History. He is rightly proud of ITTF’s museum. The museum is famous for gathering all the facts and missing pieces about who invented table tennis. They even have the originals of the first games. In the late 1880’s the game was first invented. At that time the game makers tried to emulate the popularity of lawn tennis. How did they do it? By developing an indoor version of it. But at that time, this game went by many names. The early version of the game was made by several different manufacturers. Each of them used their own exclusive patented or the trademarked name of their own. Indoor Tennis, Gossima, Whiff-waff and Ping Pong. These were some of the names they used to represent the game. Table Tennis has its roots in lawn tennis. Lawn tennis was very popular in the 1870’s and 1880’s. Alongside it, there were card games, racket and balloon games, board and dice games and even tiddly winks tennis games. Around 1884, the first use of the name Table Tennis occurred by J.H Singer on a board and dice game. A game of table tennis was offered in the USA game catalog in 1887. It was in the game catalog of George S. Parker who is the founder of the famed Parker Brothers in the USA. In 1890 the first action game of tennis on a table was held. This is when it became Table Tennis. The answer to the question is “Englishman David Foster”. He introduced the first action game of tennis on a table in 1890. An English Patent (No. 11,037) was filed on 15 July 1890. There were other contributors too. Check out our “Who invented table tennis” article for more information. The English sports company John Jaqques & Son were manufacturing the first sets of table tennis around 1898 and popularizing the game. They used paddles with vellum stretched over and an outer casing attached to a handle. It was like a small drum. The funny part is the name “Ping Pong” was derived from the sound that came from differently sized rackets striking a ball. 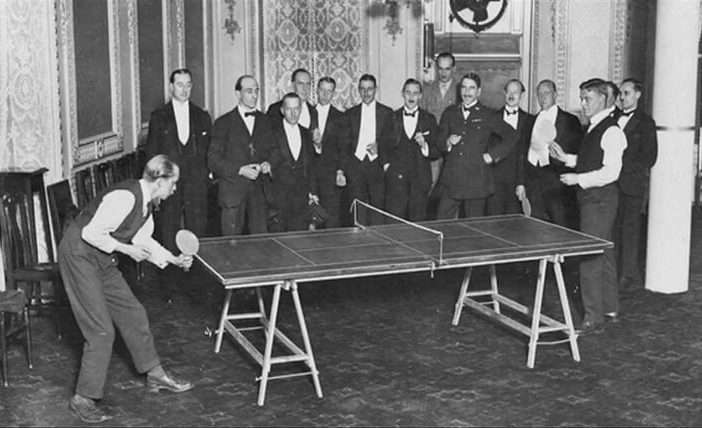 As the popularity of the game spread in Europe, “Table Tennis Association and the “Ping Pong Association” two rival organizations were set up in England. They were formed within days of each other in 1901. After this time, there was some downtime in the history of table tennis. It was thought that the game fell out of favor but by the 1920’s it was back in fashion particularly in Europe. There was still a problem with the name of this game. In the 1920’s the market leader of this sports John Jaques & Son decided that their version of this game “ping-pong” – this trademark name could be used only if their brand of equipment was specified exclusively. Things people do when they control the market. At that time more and more ping pong tournaments were being organized. To make things even worse for new companies, they threatened to take legal action against anybody who used their trademarked name “Ping Pong” without specifying the use of their equipment. The need of an alternative name was required because of their actions. This international sport needed another name and so ladies and gentlemen the name “Table Tennis” was chosen. Since that time, to be more precise… since the establishment of International Table Tennis Federation which we know as ITTF in 1926, this sport of ping pong was officially known as table tennis. Why does the name Ping Pong still exist? The very reason why people still refer to this game as Ping Pong is that it was promoted extensively in the early 1900’s. It’s hard to remove something once it gets ingrained in people’s minds. Ping Pong is still a federally registered trademark in the USA. It is now owned by Escalade Sports. They still produce a brand of equipment called Ping Pong which is still used to play table tennis. Many people use both names interchangeably. While Ping Pong remains a registered trademark and brand of equipment, the official name for the sport since 1926 is Table Tennis. After the establishment of ITTF, the face of this game improved drastically. Official rules for table tennis were agreed when Englishman Ivor Montagu was elected as the first chairman of ITTF. On 12 December 1926, the rules for International Competitions were approved. 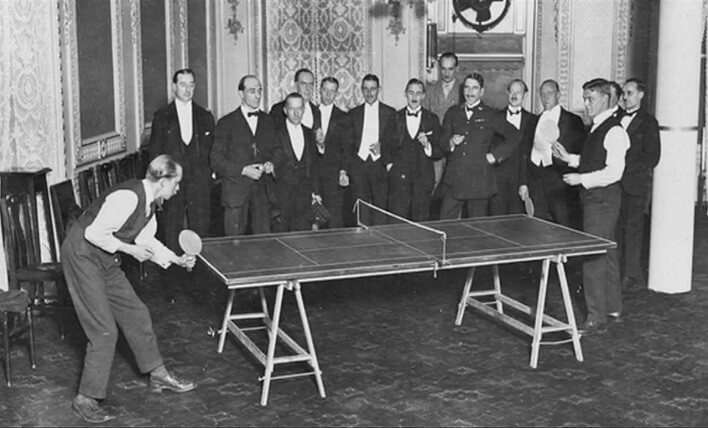 The first world championship tournament of table tennis was held in London, England from 6-11 December 1926. Since then a lot of domestic and international tournaments were held. As the popularity of this sport spread throughout the world, the Asian countries were quick to embrace the sport. They even became the world leader at that time. And that’s how this sport of playing tennis on top of a table got its name. The history of table tennis is certainly an exciting one. Stay tuned for more sports related articles. Leave a comment below if you find this article exciting.